It is time for my annual ginko tree watch. I took this photo yesterday. The photograph show the next road over. It is lined with ginko trees. Since the berries are now dropping this is a close as I wanted to get. Not much stinks as bad as a ginko berry. I'll update the photo in my next entry. I've started getting lessons again. Keep up the good work! As a reminder, remember I do not enforce the year limit. You don't need to clear this with me. If you received your materials before April 2014, let me know and I will send you the updated materials. Continuing on with how to fix mistakes, this week's video is about how to fix a missing decrease. As with all fixes, you might not get the results you want. If you don't catch a missing decrease fairly soon, you may as well rip out the work. All of the extra yarn can really make the tension look awful. 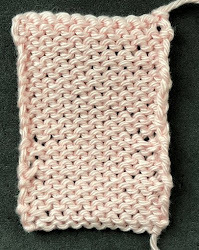 Here is a photo of a swatch where I have made a decreases after a few rows. The decreases with the black arrows were made the correct way. The ones with pink arrows were made after the rows were knit by laddering down. Note that the ones at the sides look slightly better. That is because (as you will see in the video) I made them before I had knit more rows. To make the one in the center, I laddered down from the current row. The tension for all of these is pretty bad. Yes, you could use a tapestry needle to work the excess yarn to the selvedges but that probably would take as long as ripping to the location for the decrease. Whether you opt to fix or rip depends on a couple of things. Many yarns disguise tension problems. If that is the case, go ahead and fix it. I have found that for many lace patterns the repairs aren't as noticeable. All of the holes can really hide the tension of the fix. If you do repair a decrease, make sure that it slants the right way. The video points out how to do this. Also, make sure you don't twist the stitches when repairing. It is very easy to do! Salon will be on Saturday so I can go to the Anzula Trunk show at the Stitch Niche on Sunday. I obviously love their yarn since I have used it for so many projects. It is a treat that they are in town. It will be earlier in the day (12:00-2:00) since I have to drive to CVG in the afternoon. To make up for this I am making an early morning run to Spalding Doughnuts. I hope the line isn't too long! I finished up the pleated linen shirt. I love Shibui Linen. It floats. The pleat is in the back. The front is very simple. There are saddle shoulders with the same cables as in the back. Here is a close up. I also finished the skirt, or should I say skirts as there is an overskirt and an underskirt. Here is close up of the fabric. I haven't written the pattern yet so you can see the row markers I use to show where the decrease are. Both of the models were are going to use are very tall so I had to make the skirts longer. The overskirt should come to mid calf. I had to adjust my dress form. The underskirt comes to mid thigh. I now have to knit the crop top. You heard me right. I am knitting a crop top. Don't ask. I love your linen shirt. Where/when can I can the pattern? It will be in the Spring 2016 issue of Cast on magazine.